Ryan Davis, operations manager for a company planning to drill fracking wells in Braddock, barely began his presentation Wednesday before residents interrupted. “The first thing is, we prioritize safety in all our operations,” said Davis, who hoped to inform residents of the drilling plan by New Mexico-based Merrion Oil & Gas. His statement caused many in the crowd of about 200 people to shout and laugh in disbelief. “We have had spills or things that occur. That comes with the nature of the business. ...There are some incidents where we had to do some remediation work,” Davis said later in the meeting. Merrion Oil & Gas has three ongoing permit applications to drill wells at U.S. Steel’s Edgar Thomson Steel Works and hopes to begin construction in 2020. The Pennsylvania Department of Environmental Protection [DEP] is taking public comment on one of the three permit applications until April 1. If approved, the wells will produce natural gas for 20 to 30 years, according to Merrion. Construction would take around a year. Allison Acevedo, director of the DEP Office of Environmental Justice, stepped in and tried to calm the crowd after the interruption. “Please allow Mr. Davis to speak,” she said. The crowd quieted momentarily but picked back up throughout the evening to voice concerns about potential environmental, safety and economic impacts. Before the meeting began, Acevedo walked through the crowd to thank residents for attending, including Bevelyn and Richard Cunningham, who sat at a table near the back of the large bingo hall. The Cunninghams grew up in Braddock and bought a house together when they were married. They’re now retired; he worked as an administrator for the state’s welfare office and she worked as a parent liaison for the Urban League Charter School. Their daughter, who went to college in Virginia, moved to North Braddock when she graduated. Acevedo convened the meeting for residents like the Cunninghams. Braddock is considered an environmental justice area, which is defined by the state as a community with substantial minority or Iow-income populations. 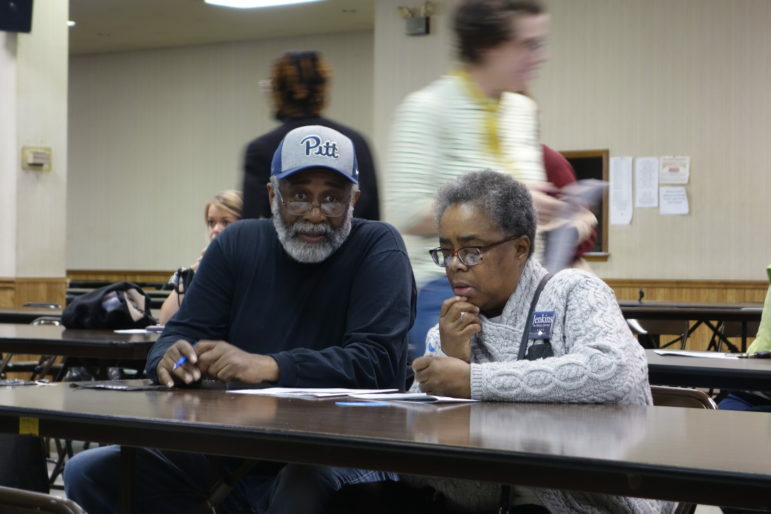 Bevelyn said she is suspicious of the drilling plans after a December fire at U.S. Steel’s Clairton Coke Works. Neither the company nor the Allegheny County Health Department informed the community that air pollution exceeding federal standards had been released until two weeks after the fire. The distrust was shared by many in the audience, leading to a raucous meeting. 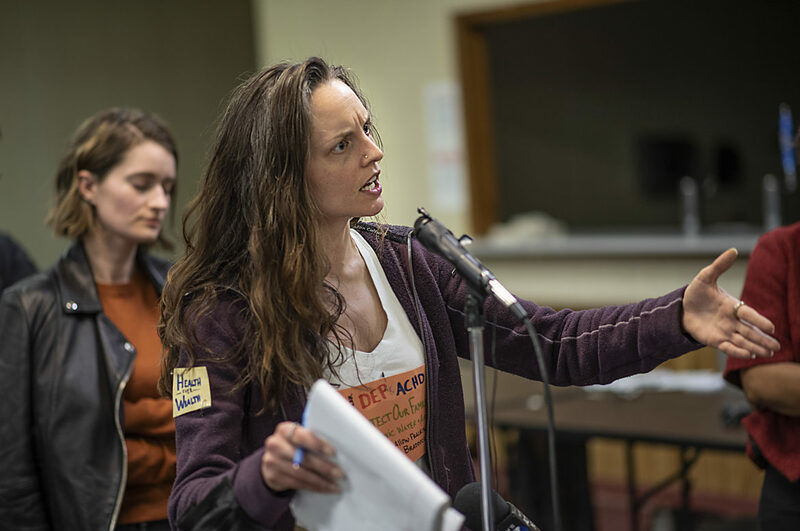 There were dozens of interruptions, shouting, pounding on tables and chanting, nearly all of which came from attendees opposed to the proposed fracking wells. One speaker voiced support for natural gas projects in the area and the potential for plastics production in the region, such as at Shell’s ethane cracker plant that is being constructed in Beaver County. Davis presented details of the project plan on a projector and its drilling history, which includes 400 wells, mostly in New Mexico. Some of those gas wells are unconventional natural gas wells located in an urban area, like the ones proposed in Braddock, Davis said. The proposed project would be its first in Pennsylvania. Nica Ross, a former Braddock resident who now lives in Pittsburgh, said the community hasn’t had a voice in the planning process. “Why didn’t we get a table at the front?” she said. Chris Masciantonio, the director of government affairs for U.S. Steel, did not directly answer an audience question about how U.S. Steel, which would receive royalty payments, would benefit financially. “Steel-making is very energy intensive,” Masciantonio said. The drilling site plan includes a short gas line on the property that would lead directly from the wells to the steel plant. “Answer the question! Answer the question!” the crowd chanted. Richard Cunningham clapped along next to his wife. After a minute of chanting, Scott Perry, the deputy secretary of the Office of Oil and Gas Management at the DEP, tried to calm down the crowd. Alyssa Catalano of North Braddock said she doesn’t see why the community should support the proposal. If the project moves forward, state, county and some municipal governments stand to eventually get some money from permit fees, although there was disagreement at the meeting about whether it would result in a few hundred dollars per year or many thousands of dollars. Davis said the local economy would see a boost from construction workers who stay in hotels and eat at restaurants. The Cunninghams didn’t feel any better about the proposed fracking project after hearing the presentation. They left early to attend a nearby Bible study. Bevelyn agreed, saying residents will just have to deal with the consequences. “They have the support of the DEP, no matter what happens with the residents,” she said. Acevedo acknowledged that, while the DEP’s environmental justice policy is the reason they were holding the meeting, the policy did not give the community any special consideration. Acevedo told the crowd that the DEP’s environmental justice policy promotes meetings to inform residents in environmental justice communities about projects that could impact them. 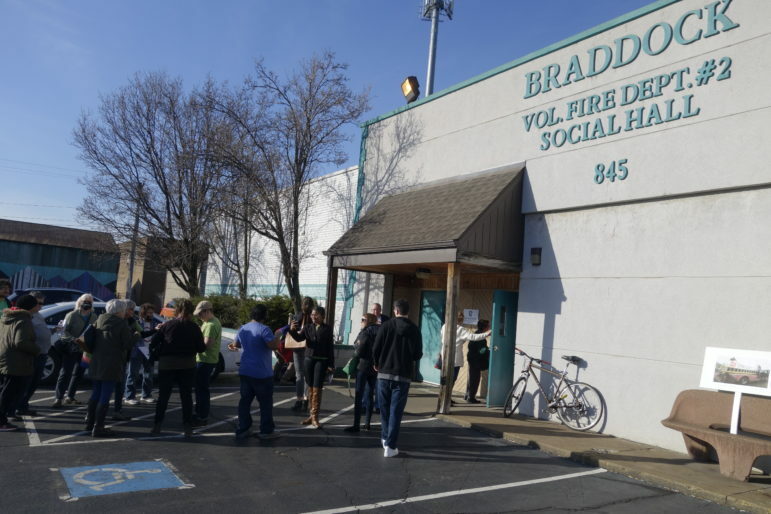 Acevedo said that an environmental justice law, which does not exist in Pennsylvania, could give communities like Braddock more power in the permitting process. For example, California in 2018 created a Bureau of Environmental Justice that has oversight, investigative and enforcement powers. Rachel Priselac of Forest Hills told the crowd she is trying to get pregnant and worries the wells could have negative health impacts. She referenced a study that showed mothers living within 1 kilometer of a fracking well in Western Pennsylvania had lower than normal birth rates. “What I can’t do is pick up and move our family away from our home because you have chosen to drill here,” she said. The meeting continued for nearly three hours until 9 p.m., an hour past its scheduled ending. The DEP representatives agreed to extend the meeting to allow all of the roughly three dozen residents who had lined up a chance to speak. Edith Abeyta, one of the last speakers, said she had been trying to get information about the proposed fracking wells since 2017. She said she is frustrated that it wasn’t clear when the DEP would make a final decision on the permit applications. The company had been allowed to revise its plans multiple times to keep the applications moving forward, and Abeyta wanted to know how many more chances the company would get. Oliver Morrison is PublicSource’s environment and health reporter. He can be reached at oliver@publicsource.org or on Twitter @ORMorrison. Attendees at an industry conference in West Virginia on Tuesday cheered projections for increased petrochemical production in the next 40 years, while protesters outside held up withered single-use plastic bags to show the environmental harm of petroleum products. Both groups, however, shared a common view that the economic hype and resulting environmental impact predicted for the region may not pan out. It's how they feel about the prospect that diverges. Thousands of Pennsylvanians are being exposed to dangerous chemicals in their drinking water—many without knowing it—and some experts feel state agencies aren’t moving quickly enough to protect residents. More than 100 students of all ages, from public, private and charter schools, traveled across the Pittsburgh region to Chatham University’s bucolic Eden Hall campus 20 miles north of the city. They were presenting sustainability projects they had implemented in their schools and communities for the third annual Seeds of Change: Igniting Student Action for Sustainable Community Conference.